The SettingsPane control allows the users to examine and modify the settings of the diagramming items in run-time. The SettingsPane control is a standalone control that can be displayed as the content of any ContentControl. 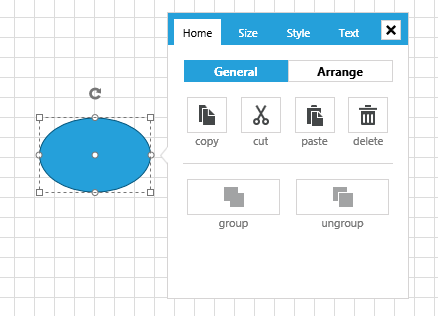 Its main purpose is to provide you with a ready-to-use view that contains the most common features and settings of a single RadDiagramItem (Shape or Connection). Change the tab headers - in order to change the headers of the tabs in the default SettingsPane, you can change the value of their localization strings. Please take a look at the Localization article to find the localization string of each tab displayed inside the SettingsPane. 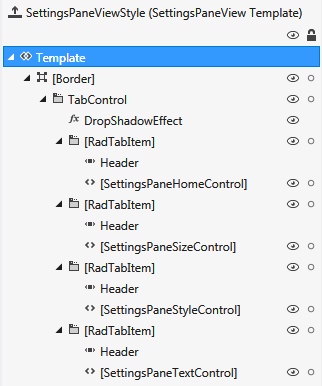 Add and remove tabs - in order to add or remove tabs from the default SettingsPane, you need to edit the ControlTemplate of the SettingsPaneView as this is the control that represents the content of the SettingsPane. 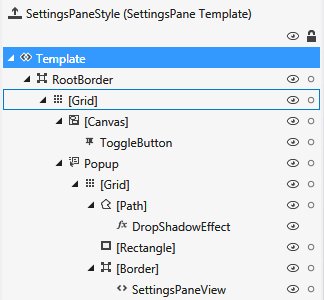 Please take a look at the SettingsPaneView ControlTemplate Structure section for more information. SettingsPaneTextControl: Representing the content of the Text tab. Furthermore, the content of each control is described in its ControlTemplate. In order to change the existing content of a SettingsPane tab, you need to edit the ControlTemplate of the appropriate control. Please note that you can handle this event in order to disable the SettingsPane from displaying on certain RadDiagramItems. ToggleButton - a RadToggleButton control that represents an inactive SettingsPane. Once this button is clicked, the SettingsPaneView gets activated and displayed.